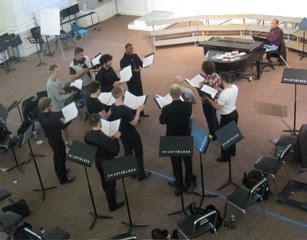 Back to our own rehearsal hall to sing Tarik O'Regan's "No Matter" (text by Samuel Beckett) again. The harmonies are close and fascinating. And it's very high for the upper voices. Tarik isn't able to be with us - too bad, the sopranos would like to have met him in person!